All of us want to have healthy eyes and optimal vision for a lifetime. The Lutein Macular Health Formula from Eye Love provides just that — the most effective, complete, easy-to-use solution for long term eye health. This formula was designed to take the best of AREDS 2 research and combine it with additional clinically proven nutrients to support macular health. – Most complete macular formula including nutrients based upon decades of ocular research on eye health. – Diets rich in Lutein and Zeaxanthin have been shown to protect against aging eyes. – Omega-3 fatty acids help maintain a healthy retina, natural lens, and macula. – Nutritional studies strongly indicate that the earlier an individual begins to make lifestyle alterations and take nutritional supplements, the less risk he or she has for degenerative eye issues. ALL LUTEIN SUPPLEMENTS ARE NOT EQUAL: By starting an eye vitamin regimen with Eye Love’s Macular Health Formula, you can be sure that you’re giving your eyes the best chance at maintaining your eye health for better vision, long into the future. Special Note: Our brand new Lutein Macular Supplement is scientifically validated, approved by medical professionals, and difficult to keep in stock. Place your order today! Eye Love is a company based in South Carolina owned by two eye doctors. With every product sold, Eye Love gives glasses, sunglasses, and an eye exam to someone who can neither afford nor obtain quality eye care. Join the Mission! ENHANCES EYE HEALTH AND VISION – Lutein, Zeaxanthin, Astaxanthin are powerful antioxidants that cross the blood-brain barrier and work alongside other vitamins and minerals to ensure macular, retinal, and eye health and function for a lifetime. The health of the macula determines our ability to read, recognize faces, drive, watch television, use a computer, and perform any other visual task that requires us to see fine detail. HOW WE ARE DIFFERENT – For every supplement sold, we give an exam, sunglasses, and glasses to someone in need. This is on top of our 100% satisfaction guarantee, which means that if you are not happy with your purchase, we will give you a full refund. JOIN THE MOVEMENT! SUPPORTS THE RETINA WITH 14 OPTIMAL NUTRIENTS – The Retina is important for capturing what you see on a daily basis. Vitamin C, Vitamin D, Vitamin E, Zinc, Copper, Selenium, Vitamin B-6, Folate, Lutein, Zeaxanthin, Bilberry, Alpha-Lipoic Acid, Grapeseed Extract, and L-Glutathione are all it takes. HELPS MAINTAIN HEALTHY MACULAR PIGMENT – Potent carotenoids within this formulation work to increase overall macular pigment density and this supports overall eye health. EASY TO USE – Just 2 capsules per day fights aging eyes and preserves your best vision. Two easy-to-swallow capsules daily supply supportive antioxidant levels. 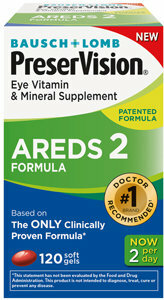 ProVision’s foundation formula for supporting macular health and vision wellness includes six key antioxidants from the AREDS 2 study calibrated in precise levels. Two capsules per day. Capsules may be opened for people with swallowing difficulties.